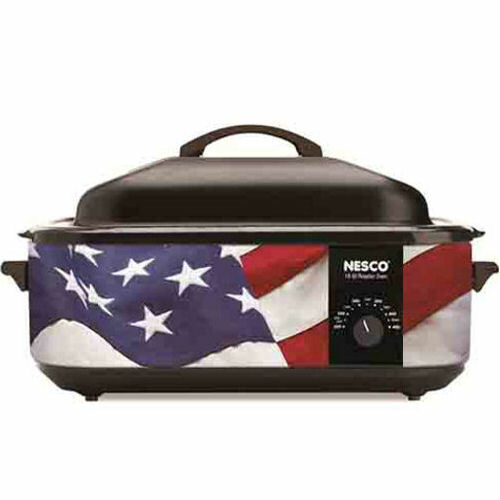 The Nesco 4818-76 is a 18-Quart patriotic design porcelain roaster. This roaster is ideal for large meals and entertaining in the home. The patented unique circle of heat™ element provides moist and even cooking. Automatic temperature control assures even, energy-efficient cooking, every time. A wide range of temperature settings from (200F-450F) which allow you to slow cook, roast, bake, steam. The single chrome steel rack includes handles for safe, easy insertion and removal of hot foods. Roast up to 22 pound turkey, pot roast, pork roast, ham, or whole chickens all in one. The Nesco S/E 18 Qt. 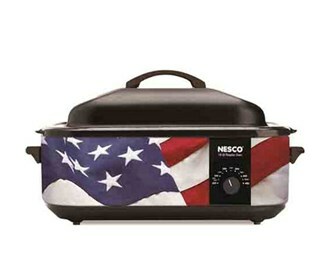 Roaster US Flag/Patriotic Porcelain Cookwell has many exciting features for users of all types. See the Nesco S/E 18 Qt. Roaster US Flag/Patriotic Porcelain Cookwell gallery images above for more product views. The Nesco S/E 18 Qt. Roaster US Flag/Patriotic Porcelain Cookwell is sold as a Brand New Unopened Item.